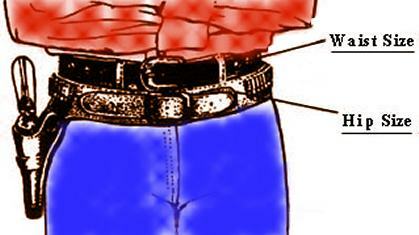 The Dodge City gunbelt is a moneybelt style gunbelt with holster. The holster has a card suit concho, spots and border tooling, is available in straight left and straight right and has a hammer thong. The gun belt is a classic old west style money belt that is made from one piece of leather folded over and sewn along the seam to creat a pocket that you can put valuables into. Available in Black, Brown and Natural. The Dodge City holster is made of two pieces of 4-5 oz. leather, laminated nap-sides together so the smooth side is out. This process gives the holster more strength and durability. The money gun belt is made of 5 oz. leather. The entire rig is has nylon stitching for durability and comes with a silver buckle. Western gun holster with card suit concho, spots and border tooling. Available in straight left or straight right.